Are you a hopeless romantic, or a lifelong beach bum? Do you want hedonistic parties, or peace and seclusion? Whatever the case, the perfect island awaits. What’s the best Greek island for you to visit? Well that depends on who you are, and what you’re looking for. 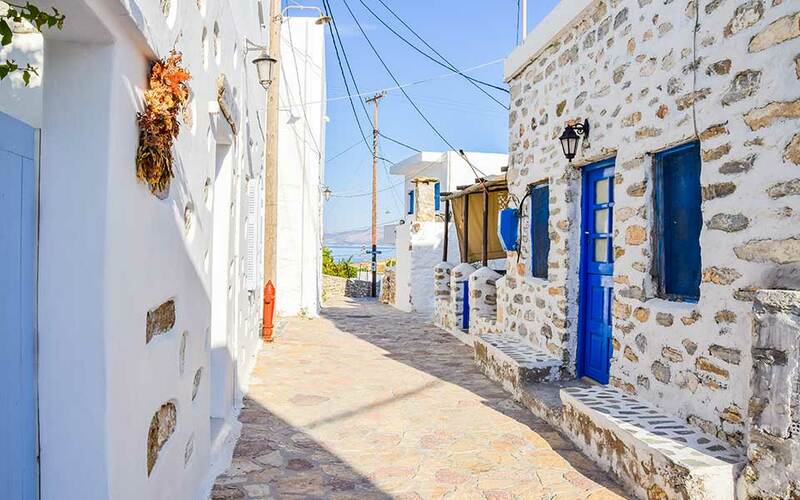 Greece has more islands than Cher has wigs; this means that beyond the obvious and iconic vacation spots like Mykonos, Santorini and Rhodes there are quite literally hundreds of alluring isles to choose from, and myriad mini-archipelagos to explore. Doing so can be fun as long you as give yourself enough time – but truth be told? You’ll never have enough. To simplify the hunt we’ve created a little Greek island finder focusing here on the islands of the Cyclades and Dodecanese (which are, for the most part, all easily accessible via the port of Piraeus). Some categories like Beach Bum are obvious, others a bit less, like Culture Lover – because some islands have cultural notes as worthwhile as taking another dip in the Aegean. 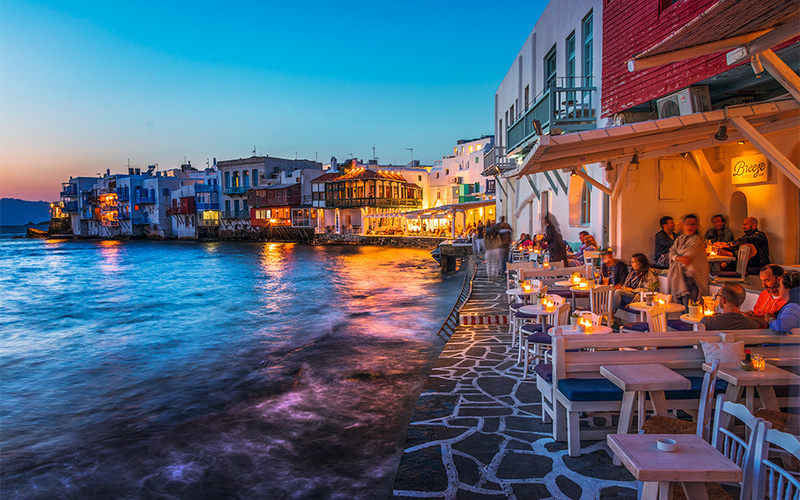 Of course, if you’re a night clubber, you could be forgiven for skipping this list and jetting straight to Mykonos, but take heed…Greece is often more than it seems, and there’s more to even that hallowed party spot than first meets the eye (or ear). One of the world’s most famous sunsets. 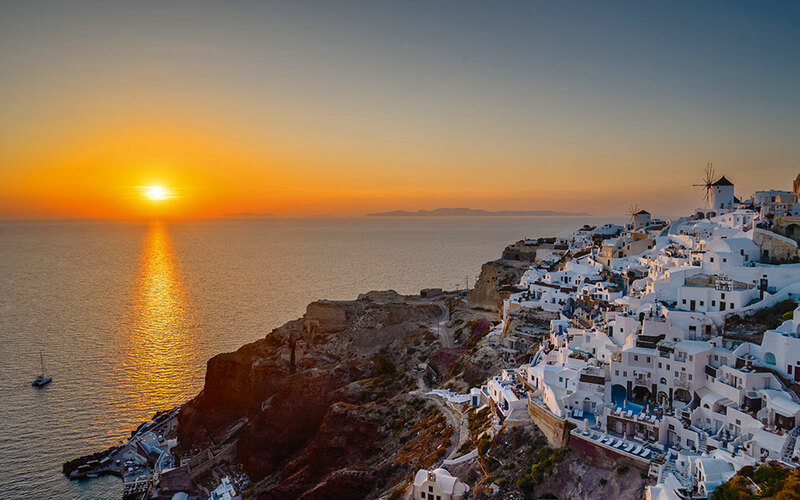 What to see: Principally what isn’t there – where there used to be more island, now there is the world’s most dramatic volcanic caldera, and much of the scenic thrill of Santorini is simply gazing out over the sea-filled crater, especially at sunset. But don’t miss the spectacular Minoan ruins at Akrotiri or the beaches, some of which have reddish or black-colored sand. Getting there: As the most popular Greek island, hands down, Santorini is also one of the most accessible islands, with frequent ferry service from Piraeus (and from Heraklion in Crete in summer), as well as regular air connections from Athens. From Piraeus, count on as little as 4 hours and 50 minutes or as much as 7 hours and 45 minutes to get there, depending on the ferry. Did you know? Santorini’s native Assyrtiko white wine is exceptionally good. 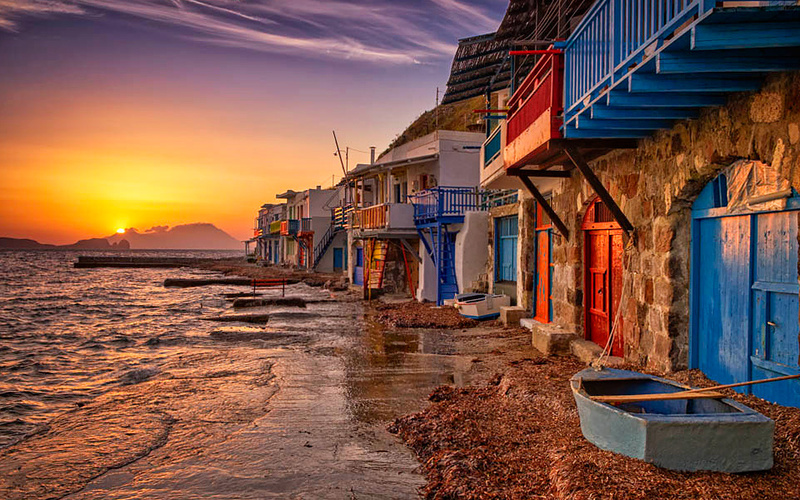 The colorful doors of Klima village on Milos. 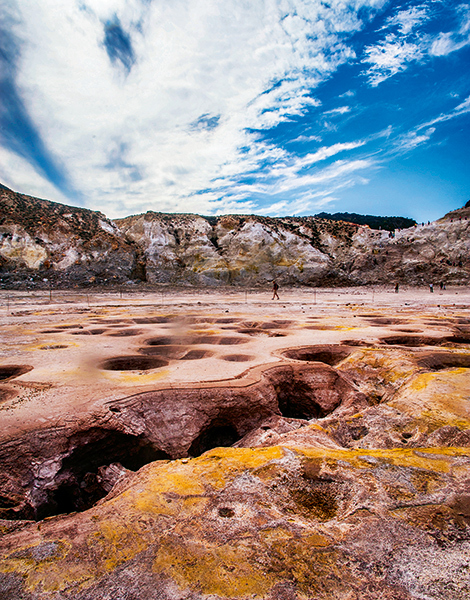 What to see: The volcanic sand beaches (any or all of them) and the mind-blowingly gorgeous, alabaster white volcanic coastal formations at Sarakiniko. Getting there: Frequent daily ferry service from Piraeus. Did you know? Milos was formed not with a single bang like Santorini but rather from successive underwater volcanic eruptions over hundreds of thousands of years. 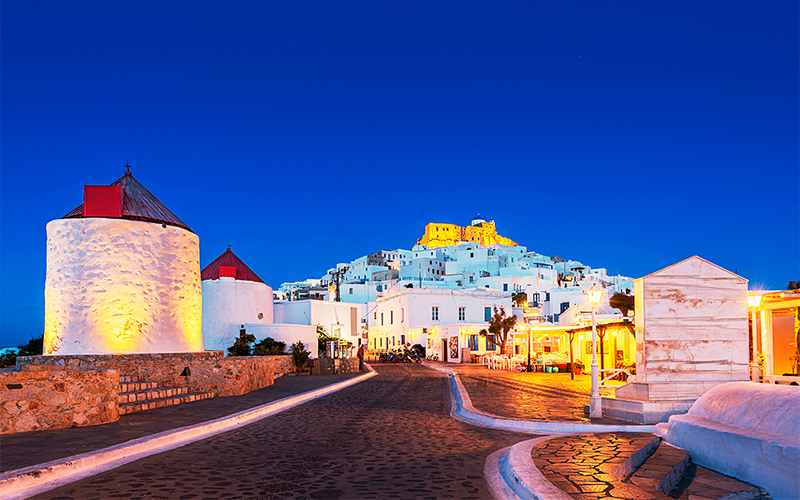 What to see: The Hora, or main town on this butterfly-shaped island rises up to the medieval Kastro (castle) and is a mesmerizing mash-up of Cycladic and Dodecanese elements. Getting there: Astypalea is 175 nautical miles from Piraeus and the direct ferry takes about nine hours, but the island has an airport so consider a short hop on Aegean Airlines instead. Did you know? In very ancient times the island was called Ichthyoessa, a reference to the abundant fish of the island’s coasts, and today it is sometimes called Astropalia. Avlemonas village in the island of Kythira. What to see: The ravishing scenery and romantic ruins befitting an island at the crossroads of many cultures. Getting there: Approximately 7 hours by ferry from Piraeus. Did you know? The ever-popular goddess of love, Aphrodite, was born in Kythira (and then drifted to Cyprus in a seashell). What to see: The white church of Theotokou Kalamiotissa atop the high peak of Mt. 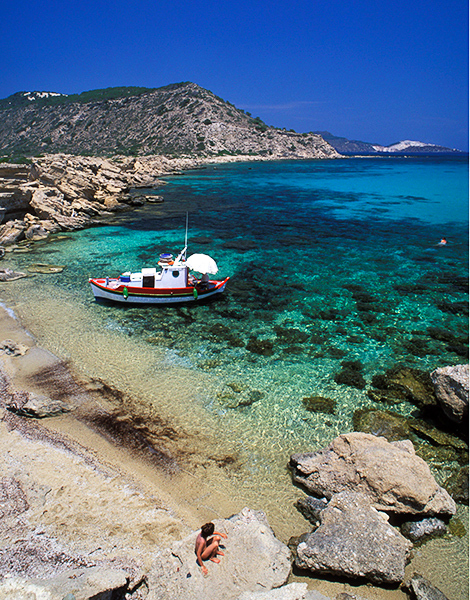 Kalamos; the beaches of Roukounas and Klisidi. Getting there: About 11 hours via ferry from Piraeus, but in summer there are shorter connections from Santorini. Did you know? Anafiotika, the Cycladic-style oasis beneath the Acropolis in Athens, was built by 19th century emigrants from Anafi. What to see: The dazzling azure blue waters. Getting there: In summer you can do the trip in under five hours via ferry from Piraeus. Boats also leave from nearby Naxos. Did you know? One of Lesser Cyclades, the small islands within the orbit of much larger Naxos including Irakleia and Schinousa, Koufonisia is high on escape appeal but low on available accommodations, so in peak season it pays to plan ahead of time. 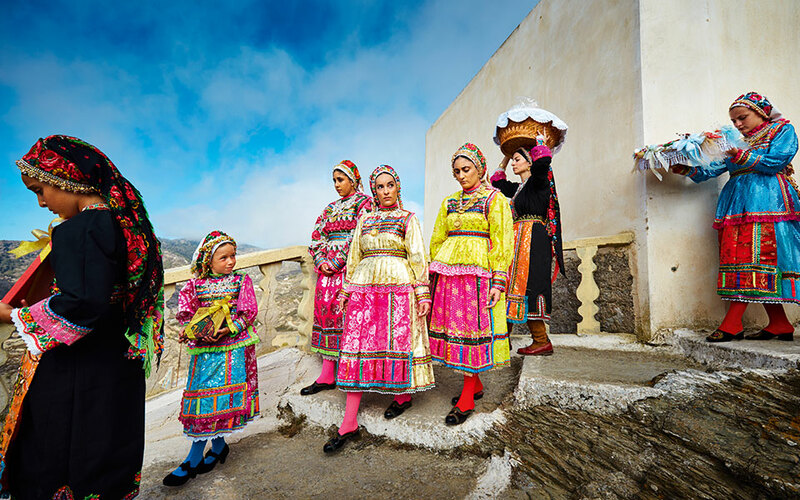 Young women from Olympos on Karpathos in traditional dress. What to see: Spectacularly rugged scenery, stunning beaches, the northern mountain village of Olympos with its unique culture, such as the womens’ wearing of colorful traditional clothing, authentic folk processions and famous home-baked breads. Getting there: Ferries from Piraeus to this remote island are generally going to be overnight affairs; consider flying instead. It is also accessible by boat from Crete. Did you know? With its shallow reefs teeming with marine life, underwater cliffs and shipwrecks, the sea around Karpathos is a diver’s paradise. 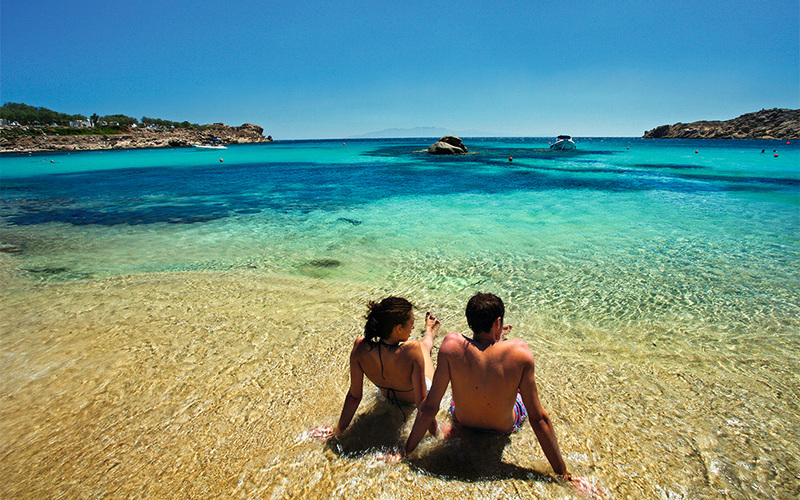 What to see: Beaches like Platys Gialos and Tourkomnina (sandy) and Hohlakoura and Papantria (pebbly), to name just a few. Getting there: Ferries leaving Piraeus, with stops, will take from 8 to 9 hours. Did you know? Lipsi is the mythical island of Kalypso, the nymph who drew Odysseus into her fold for seven years. Also consider: Any island after November. What to see: As many hip beach bars and pink-hued sunsets as you can manage. Many of the more luxurious hotels are found on the Aghios Ioannis peninsula south of Hora. Getting there: Frequent ferry service from Piraeus and in summer, from Rafina as well. Flying is another option, though Mykonos’s airport gets uncomfortably cramped in peak season. Did you know? Though beaches like Platis Gialos and Paradise are famous (and often crowded), you can still have something of that unspoiled Cycladic island feel at spots like Aghia Anna Beach in the south and Fokos in the north. 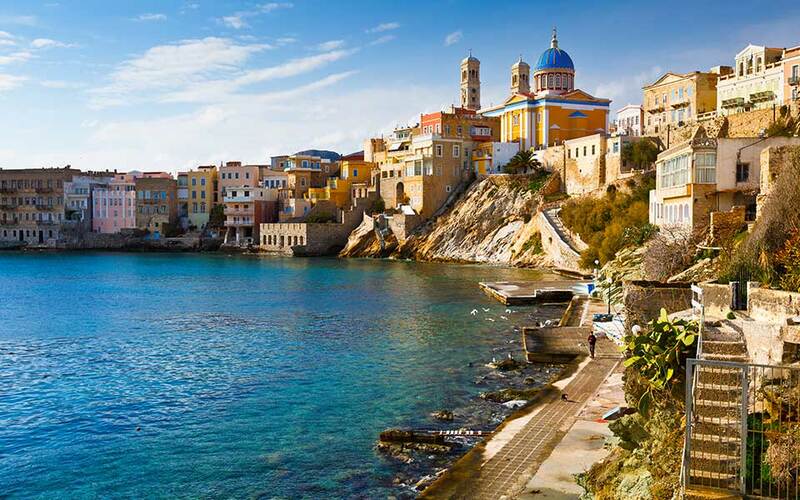 What to see: The main town in Syros, Ermoupoli, is the capital of the Cyclades and a gem of Italianate architecture. Getting there: Very frequent departures from Piraeus all year long usually take about three and a half hours, but sometimes less than two. Did you know? The Church of the Dormition of the Virgin houses an icon painted by El Greco. The Grotto of St John the Theologian on Patmos island, a UNESCO World Heritage Site. 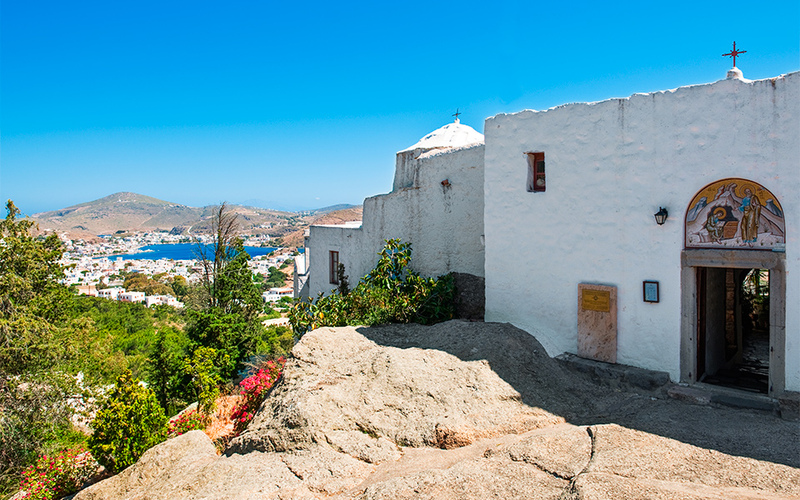 What to see: Sightseeing-wise the Monastery of St John and Cave of the Apocalypse are key, but it’s the absence of tourist spots (plus a lovely Hora and chiseled coast) that help make Patmos the chicest getaway in this corner of the Aegean. Getting there: Ferry routes from Piraeus to Patmos run about 7 to 9 hours. Did you know? The island’s important early Christian heritage lives on in traditions such as the elaborate celebrations during the Greek Easter period. 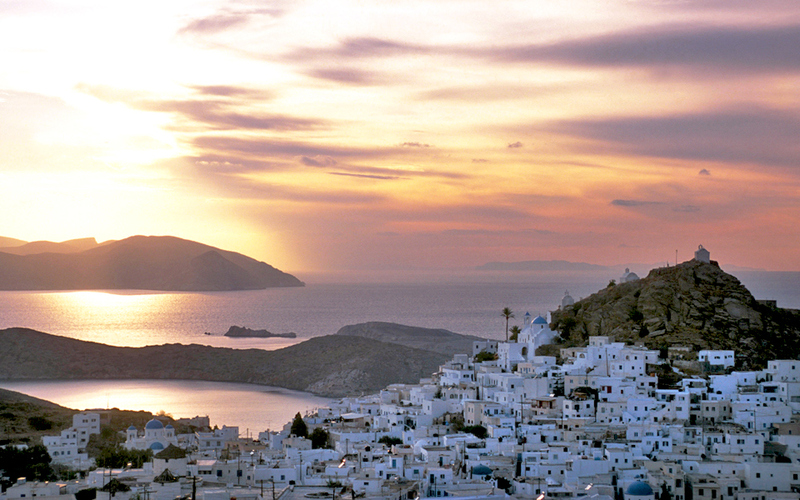 What to see: Hora is Ios‘ main town and is one of the most picturesque in the Aegean. Getting there: Ferries range from 4 to 7 hours depending on the vessel. Did you know? Despite its reputation as a party island, the unspoiled beaches at spots like Manganari will dazzle you. What to see: You’ll arrive at the busy main port, Parikia, but go as fast as you can to the much more beautiful Naoussa on the north coast of the island. Getting there: Ferries very frequent from Piraeus, count on 3 to 4 hours. Did you know? 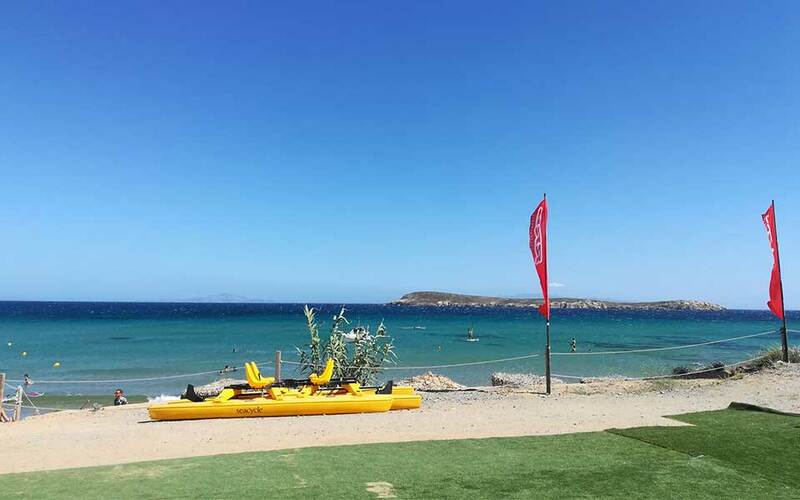 Golden Beach on the southeast side of Paros is your best bet for windsurfing. What to see: Minoan ruins, charming cities and everything in between—including some of the best beaches in the Mediterranean. Did you know? Crete is the fifth largest island in the Mediterranean Sea and its capital city, Heraklion, was named for the mythological hero Hercules. 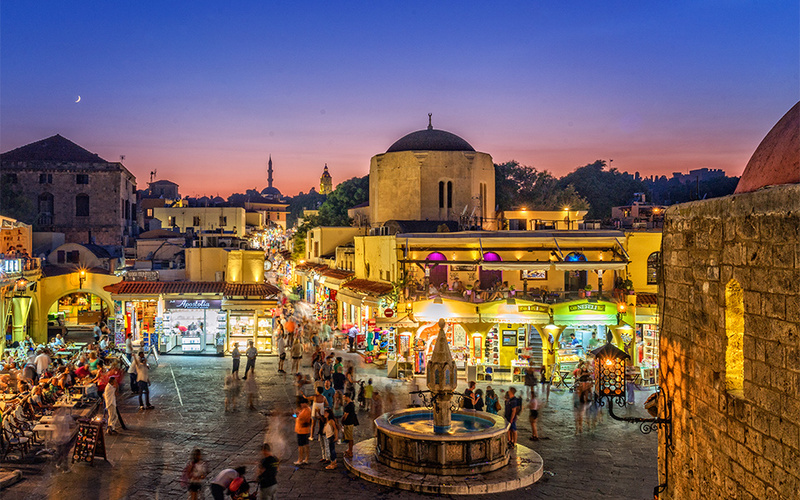 At the Old Town of Rhodes. Do you like your ruins ancient, medieval or both? 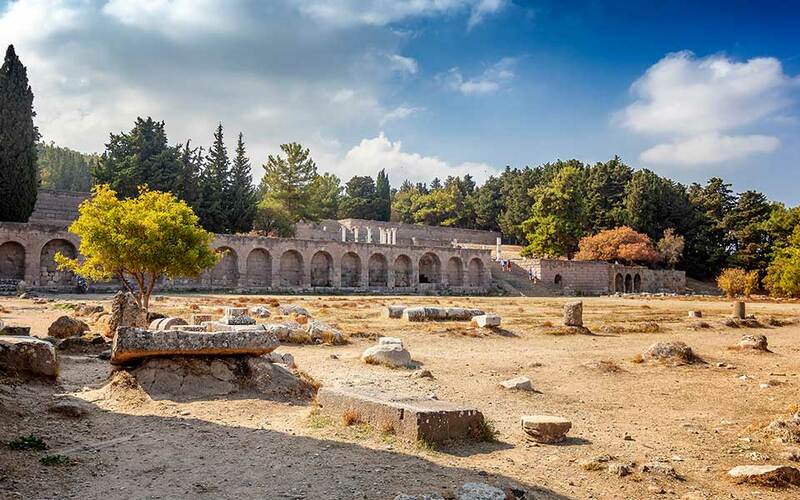 What to see: The Colossus of Rhodes is long gone, but the medieval Palace of the Grand Master of the Knights of Rhodes is pretty monumental. So is the Lindos Acropolis, 50 kilometers south. Getting there: About 13 hours by ferry from Piraeus, or an hour by plane from Athens. 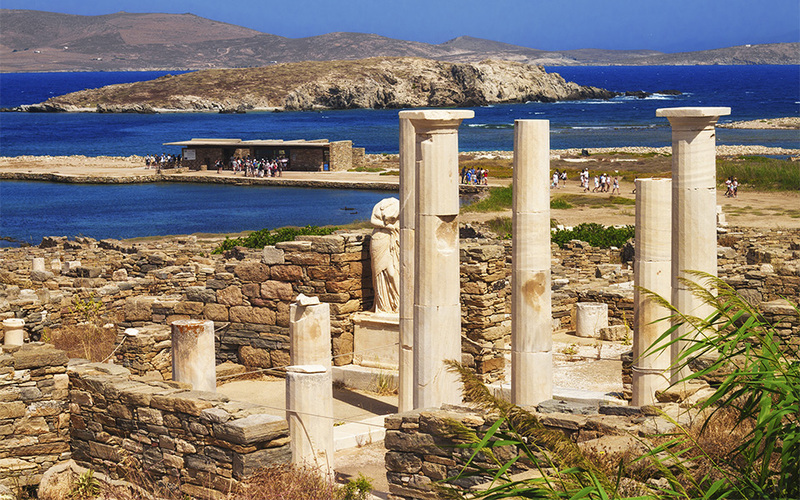 What to see: Situated slightly southwest of Mykonos (from which there is boat service), Delos was an ancient cult center and is now home to a sprawling and spectacular archaeological site. Getting there: Anytime you find yourself in Mykonos, consider Delos your essential cultural corollary…it’s a short boat ride to another world. Did you know? Myth alert! Sun-drenched Delos was among other things the mythological birthplace of Apollo, Greek god of light (and other things), and according to a different kind of myth it was a piece of Sicily that went missing until Poseidon made it stay put here in the Cyclades. 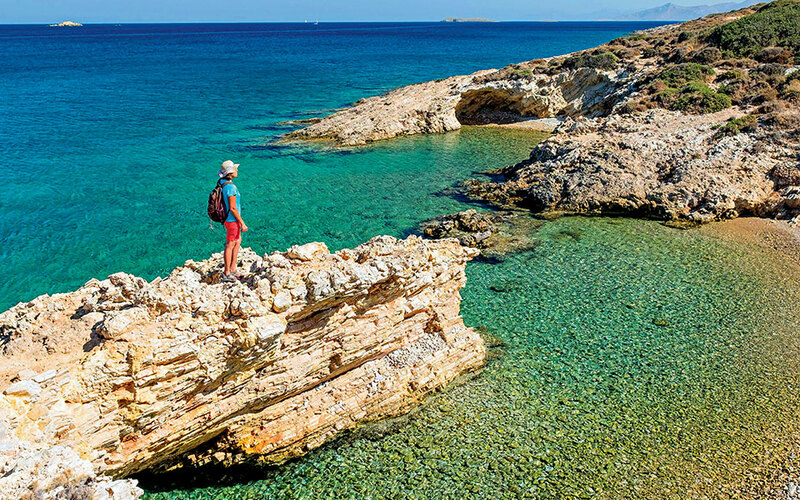 What to see: A longtime favorite Mediterranean holiday island, Kos is also a cultural heavyweight and birthplace of Hippocrates. The ruins of the Asclepieon, a sprawling temple of healing, are a must. Did you know? Abundant ancient Greek and Roman ruins make Kos an archaeology buff’s dream; orientate yourself in the fine Archaeological Museum of Kos. 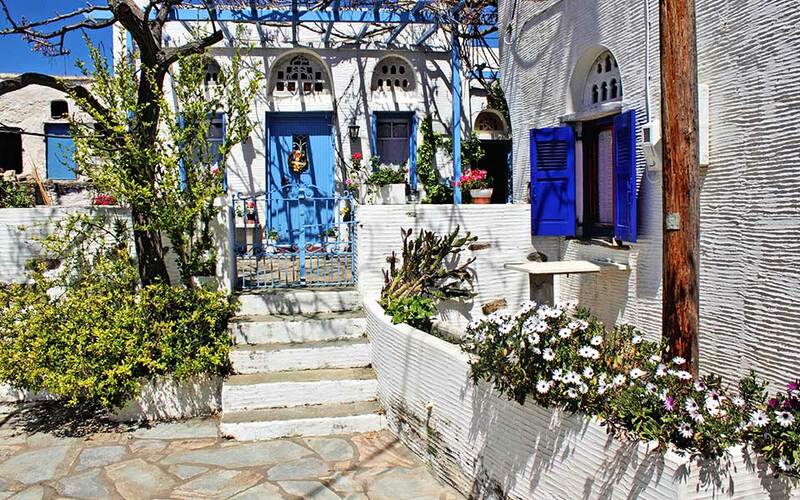 Traditional houses at Volax village in Tinos. What to see: The beautiful Church of Panaghia Evangelistria in Tinos port is the focal point of an important yearly pilgrimage every August 15 (Dormition of the Virgin Mary). Did you know? Close to Syros and Mykonos, Tinos has seen its star rise on account of its relaxed vibe and interesting, hilly landscapes such as the eerie boulders of Volax. The beach of Aghios Antonios on the islet of Gyali, a neighbor of Nisyros. 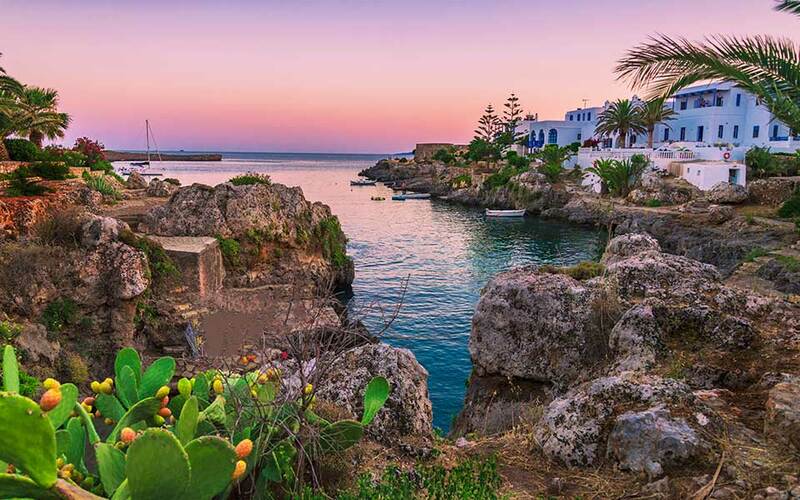 What to see: The crater at the center of the island is the sight to see, but the soft island charm of Mandraki and volcanic sand beaches will also stop you in your tracks. Getting there: The 13-hour ferry from Piraeus will get you to the island in the middle of the night but hey, you’ll be in Nisyros and your friends won’t. Did you know? Homer included little Nisyros in his Catalogue of Ships partaking in the Trojan War. 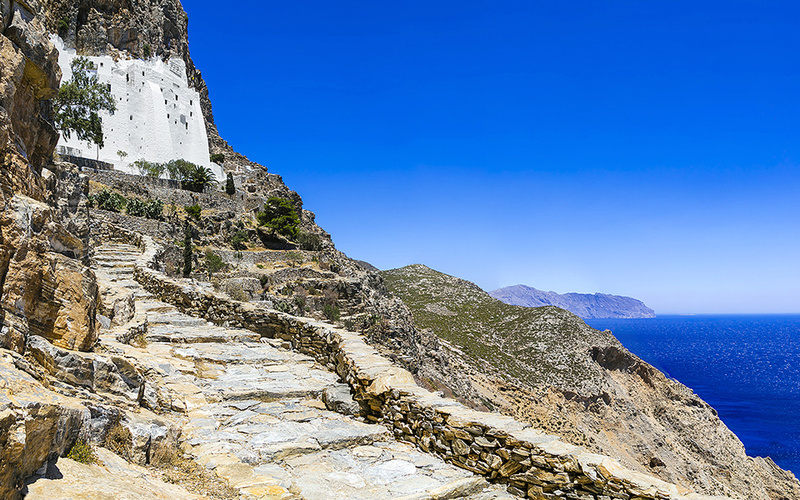 What to see: The ancient white cliffside monastery of Hozoviotissa may be the country’s second oldest, but it’s rapidly becoming one of the most Instagrammed spots in the Greek islands. Getting there: Piraeus ferries from around five hours to around seven and a half hours; a single ferry from Rafina takes just over six hours to reach the island’s port of Katapola. Did you know? Amorgos is a kind of flax. 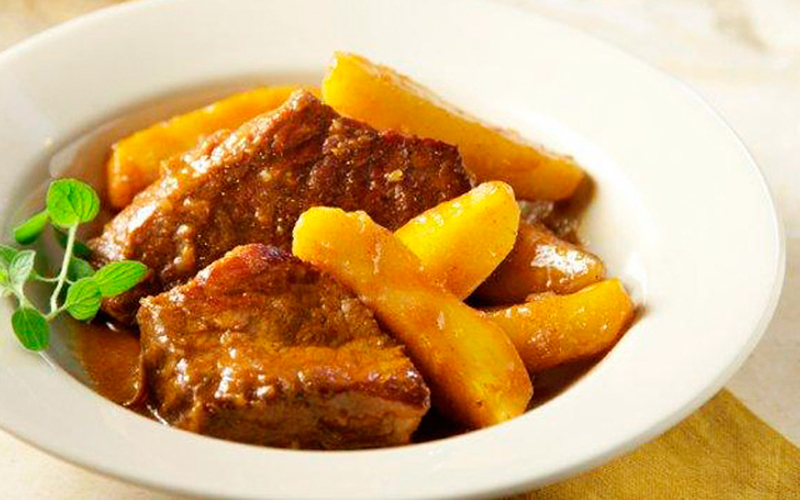 Traditional beef with tomato sauce in Sifnos. 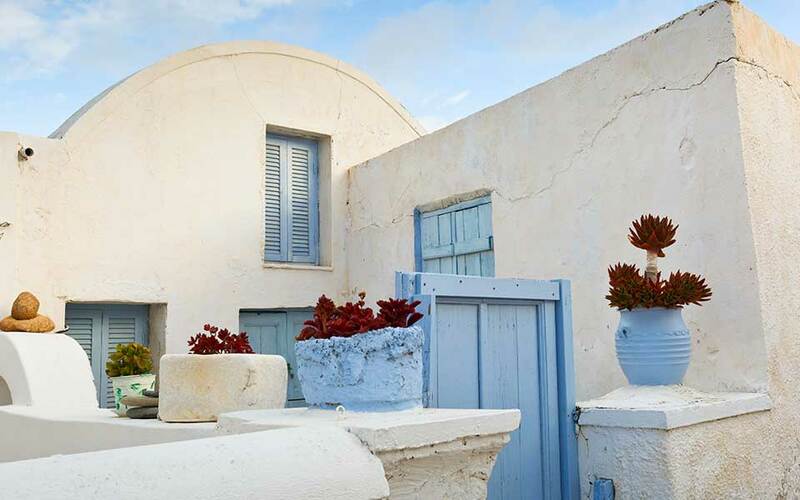 What to see: The pretty main town of Apollonia in the center of the island, home to many fine restaurants, and the arhontika (mansions) in the seaside Kastro. Getting there: The Seajet from Piraeus can take as little as two hours and nine minutes to reach Sifnos. Did you know? Sifnos is a gourmet’s delight, as Scarlett Johansson discovered when she slipped into the inventive Omega3 “fish bar” in Platis Gialos. 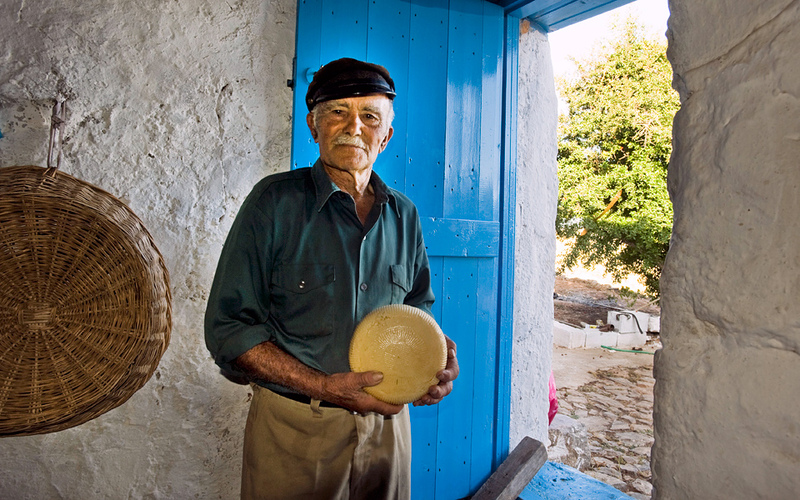 The people of Kasos have been producing cheeses of excellent quality for decades. What to see: An island junkie’s island, the history of Kasos is inextricably linked with that of the Greek Revolution, as you’ll learn at the Nautical Museum. Getting there: You better like boats. A lot. That said, if you want to break up the journey you can travel there via Crete. Did you know? From Mediterranean parrotfish to delicious Kasiot cheeses, the island is full of locavore foodie delights. 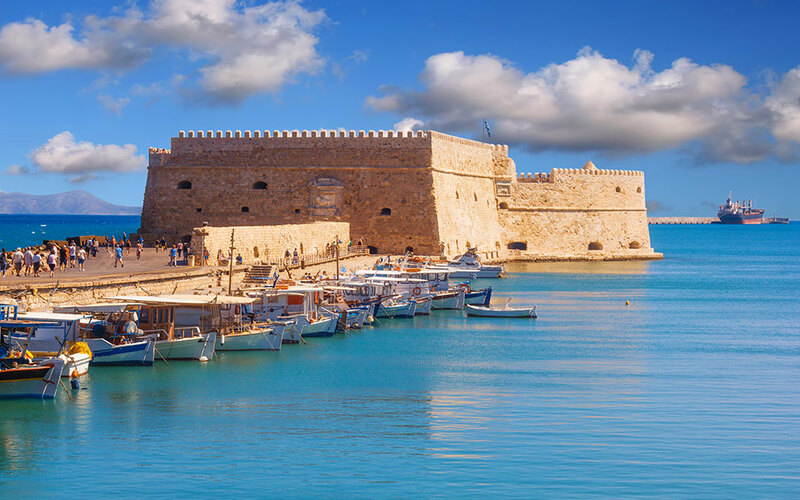 What to see: The historic and bustling cities of Heraklion and Hania, Minoan palace ruins at Knossos and Phaistos, spectacular stretches of Cretan coast. Getting there: Frequent ferry connections from Piraeus on Anek, Blue Star Ferries and Minoan Lines; frequent flights from Athens to Heraklion and Hania on Aegean. Did you know? 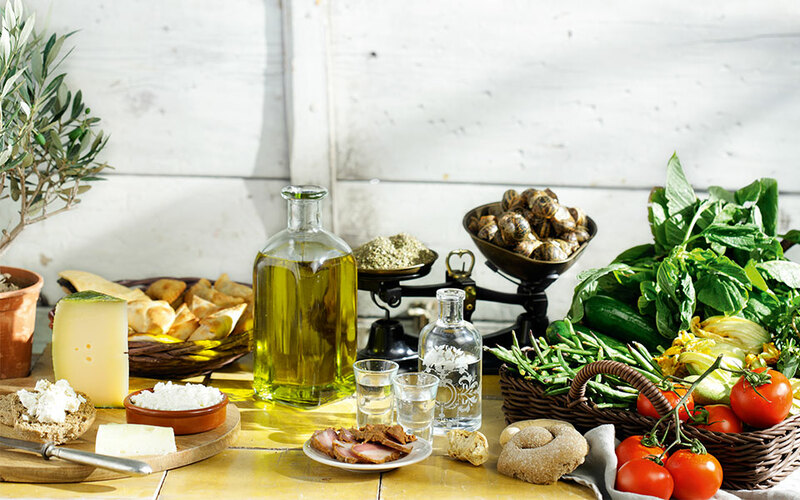 Cretan cuisine is so diverse and reliably good that locals regularly ship homegrown and homecooked items to their family members living in Athens and elsewhere in Greece.